Yep hoping for some good rain, must be something about constant rain its just so soothing. Had a few good bursts Xmas day which was really good. As for EC still looks to be showing quite a nice setup synoptically, probably still a bit out of the 3 day outlook but looks more realistic. Wynnum Nth 24 hour rain 3.4mm. 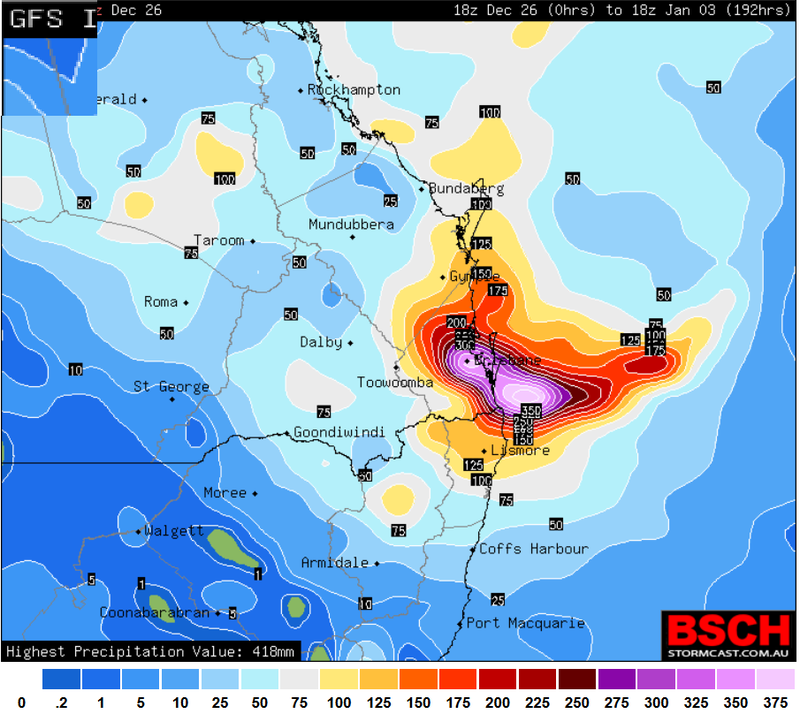 18z GFS progging 400+ mm for coastal parts of SEQ. 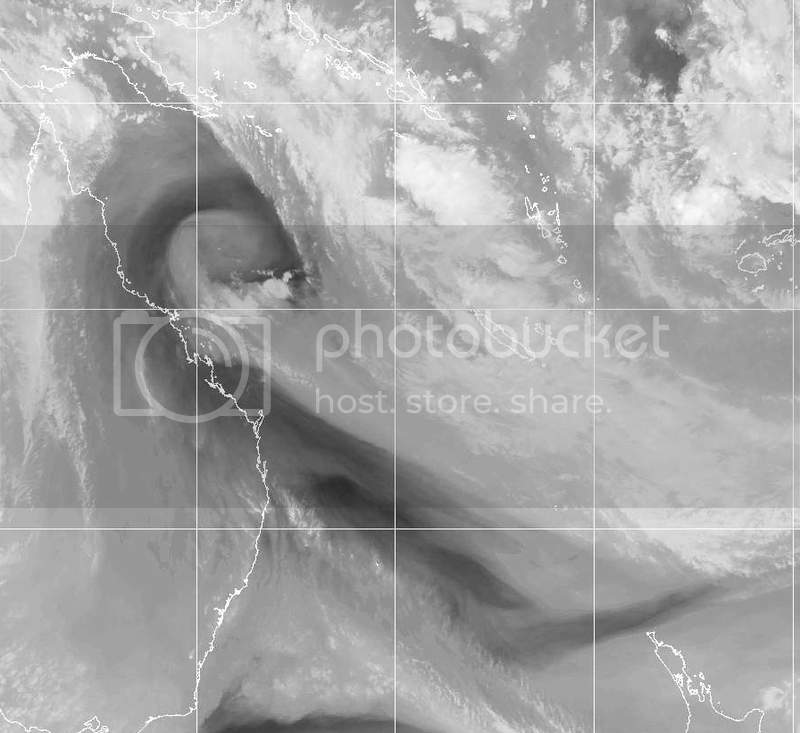 A weak surface low forming around CQ drags the monsoon trough down dumping the rain. Same potential system others have talked about earlier. We'll definitely get rain from this. EC is now consistently saying falls of 50 mm for Bris over Jan 2/3. Last 3 runs of GFS have had 150, 50, 400 over SEQ. Everything depends on the setup for where the falls hit and how much. Whole week to go still so anything could happen. Was just taking a look at that run. First really big rainfall event forecast for quite a while. Hoping to see it hold in subsequent runs. Interesting looking at BOMs SST chart, still a narrow cold area south of Fraser, with a warm tongue offshore past Byron. CS warming up nicely with the Gulf SST really hot. If that Low does make its way down, hoping for a Dam filler. It looks like it could be a bit of an extended rain event. Some hint that it just doesn't clear out in the showery/rain conditions continue for a while. Someone start a thread and make it go away! EC still looks nothing like that. The present uncertainty is the disparity between GFS and EC. In the coming days with some consensus, we shall see which one of these scenarios prevails. For what it's worth at this early stage, my money's on GFS, for the simple reason that it does better than EC when it comes to the development and movement of monsoon troughs. All that yummy moisture to the north of it. EC's Ensemble showing the uncertainty of the developments/spread of the low off the north QLD coast in tonight's run. I won't be surprised if 2 lows will eventually be the outcome by how active the monsoon trough will be. One to move west the other south. Still pretty well nothing on ACCESS-G. I don't have much faith in GFS, CMC or NOCRAPS at all tbh. I wonder why ACCESS isn't picking it up? Because it's not a sure thing. GFS is just one possible scenario. I actually like Access-G. Has a nice trough with a big southerly change coming through perfectly on time next Monday. Would be good storm action. Looks like we're going to win either way (GFS or Access-G). Not at all certain, just interesting to watch. Having flashbacks to the 2 Jan 2009 non-event here. http://forum.weatherzone.com.au/ubbthreads.php/topics/710306/1. I wonder how long GFS and NOGAPS will persist with it this time? Even if it doesn't happen, there's still a front moving through next week, but because storms are so hit and miss I think many of us would just prefer a widespread rain event at this point. That what we need at the moment is a widespread rain event considering the storm season here is pretty poor lately and Brisbane's dams are starting to drop again. If its still there Friday night I will get excited but every model so so different. WOW @ EC this morning, it now has a second low and huge convergence coming down the coast but stalling on the Capricornia Coast. One step closer to GFS, not quite as far south though. Definitely an eye opener now. Generated in 0.253 seconds in which 0.239 seconds were spent on a total of 13 queries. Zlib compression disabled.